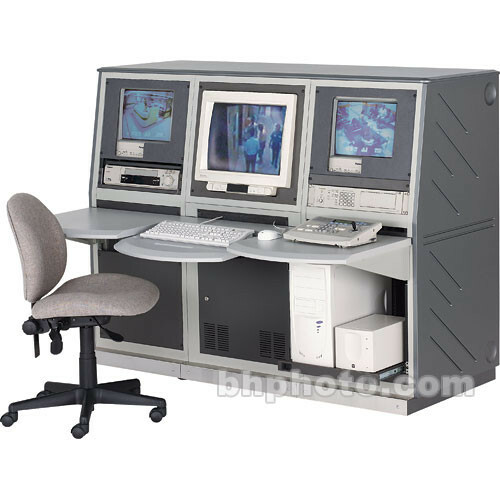 The Winsted K8493 19-1/4" Three-Bay Slope Video Console is a sturdy modular console from the System/85 series, designed to meet the needs control and security centers, as well as video editing rooms. The sturdy steel construction and smooth Truform work surface these units ideal for years of attractive, comfortable and reliable use. Additionally, the top and side panels are made of Truform, available in eight colors. This unit includes an adjustable keyboard tray within the work surface. This unit has three 19-1/4" tall spaces with room to accommodate two monitors and desktop controllers. Additionally, there are three cabinet spaces beneath the work surface which can be sealed, open, or fitted with optional solid or transparent doors. All consoles are highly customizable, and the Winsted design team will work with customers free of charge to come up with the ideal work-center configuration. A wide range of accessories is also available. Winsted provides several options for shipping and installation. System/85 modular consoles are designed to pack a lot of functionality into a small space while giving users a comfortable working environment. The smooth, beveled Truform work surface is easy on the wrists. Lift-off side panels offer quick access to equipment for maintenance. The Truform work surface, top and side panels are available in eight matching colors. This unit also includes an adjustable keyboard within the work surface. The System/85 series of consoles is designed to meet EIA (Electronic Industries Alliance) standards for control room and security center equipment. Each of the display bays accommodates a large monitor, and there is space above the monitors for desktop controllers. Flat-tapped rack rails are available free on request. Under the counter is more space for CPUs and other equipment. These cabinets can be sealed with blank plates, opened up to reveal a roomy shelf, or fitted with solid or transparent security doors. All the models in this series come ready for expansion as work center needs grown and change. Other modules in a variety of configurations may be added to the unit. A wide range of accessories is available to outfit each console to meet system and user needs. These include wall-mount monitor shelves, filing cabinets, equipment carts, wire guides, electrical outlets, fan assemblies, drawers, pull-out shelves, keyboard trays, casters, as well as masks and fillers for the equipment bays. Winsted's team of design experts will work free of charge to help the customer configure consoles for their specific needs. Then the consoles may be preassembled at the factory or flat-packed to save on shipping costs. Optionally, Winsted will dispatch a trained technician to install the console at the customer site.